What's done in Vegas...will be judged by God. Man says..."I am good enough to go to Heaven." "He who trusts in his own heart is a fool..."
So Jesus said to him, "Why do you call Me good? No one is good but One, that is, God." "And He said, "What comes out of a man, that defiles a man." is a small group of dedicated Christians in Kansas City committed to spreading the Gospel of Jesus Christ to a lost and dying world. 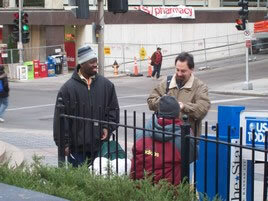 We hit the streets in the Kansas City area to spread the good news of salvation. Without Christ a person has no hope of salvation or Heaven. Why? Christ is the only one who satisfied the wrath of a Perfect, Holy, Loving God by dying on a cross for the sins YOU have done! And He said to them, "Go into all the world and preach the gospel to every creature." This is not our message. We are simply the messengers. We didn't write the Bible. God has revealed Himself to mankind through Jesus Christ. The evidence for this is overwhelming. This is the message of the Living Creator of the Universe. The Jesus Christ of the Holy Scriptures, not our imagination. The world is passing away, people are dying and losing their souls. Most people get it right when they say "God is loving." This is true. However what they don't talk about is God is also "Just, Holy, and Righteous." "Now the Lord descended in the cloud and stood with him there, and proclaimed the name of the Lord. And the Lord passed before him and proclaimed, "The Lord, the Lord God, merciful and gracious, longsuffering, and abounding in goodness and truth, keeping mercy for thousands, forgiving iniquity and transgression and sin, by no means clearing the guilty..."
Think of a person you love in this world, your mother, father, child, friend, your spouse. Now imagine someone kidnapping this person you love, torturing and murdering them. You would be angry at what happened wouldn't you? God is angry at sin. He is too holy to turn a blind eye to sin. God is so good and so loving He will make sure all sin is accounted for in His perfect courtroom. God...is...perfect. His love is perfect, and so is His justice. The question is, what does 100% justice look like? God will judge every idle word that came out of your mouth, every thought, every deed, and the good you have failed to do in your entire life. IF you sin only once in thought, word or deed you are not going to Heaven. His standard is so high that no one can meet it, not me, not you, no one. This is the God of the Bible. If you don't believe this, its probably because you don't read the Bible. You might be placing your faith in what other people tell you about God. Or you don't read it because you prefer to create your own "god" in your mind that you are more comfortable with. A "god" that doesn't care about your sins. That is idolatry. Idolators will not inherit the Kingdom of Heaven. "How then shall they call on Him in whom they have not believed? And how shall they believe in Him of whom they have not heard? And how shall they hear without a preacher?" Anyone who hears the Gospel, responds with a broken and contrite heart, and puts their complete and total trust in Christ ALONE for salvation will become born again by God's Spirit, ALL their sins are forgiven for the rest of their life, and will go to Heaven upon death. That is WONDERFUL news! How could we not share this message with the world?